I think that spring has finally arrived when the chiffchaffs are calling, but this can be misleading. However, once the butterflies are out, and, in particular, the ones that didn’t overwinter as adults, then I know spring is here. 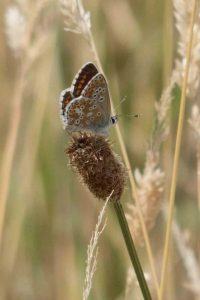 There are a few butterflies that are due out in the first weeks of April. One of the most distinctive (well, the males, anyway), is the orange tip. 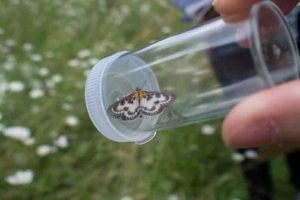 These butterflies are found along many lanes, and are particularly fond of garlic mustard (as shown above) and cuckoo flower which are amongst the food plants of the caterpillar. 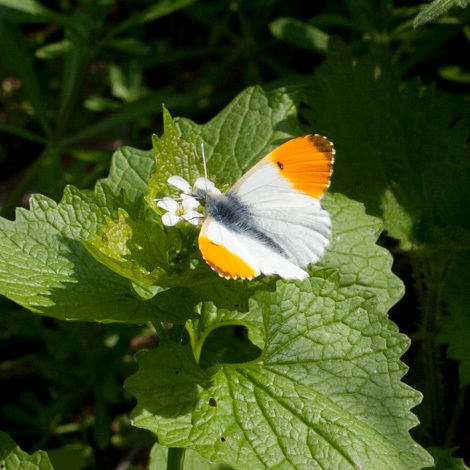 The female orange tip looks like the male, but without the orange tips, so could be confused with some of the other whites. But once the wings are folded it is again unmistakeable with green mottling on the underside. Although they are usually seen in May, if the weather is warm they might be out in April. However, blink and you will miss them – they will be more or less gone by the middle of June. Today seemed like a good day to go insect hunting. The sun was out, the sky was blue and, for a change, it was warm. As the back garden seemed mainly to have flies in it and little else (other than a rather lovely toad) of interest, I put my boots on and we went for a walk along some of our bee transect. However, we hadn’t even got as far as the old railway track before the butterflies were out showing themselves. And, to be fair, the front garden had a couple of bees (red-tailed and tree bee) as well as a basking small tortoiseshell. We walked for a mile or two, and saw butterflies in many of the sections we went along, although, noticeably, not in the newer housing sections – good job as they probably would have starved. There are four, possibly five, butterflies that overwinter as adults – the jury is out on the red admiral which normal migrates over. The definite four are Brimstone, Comma, Small Tortoiseshell and Peacock and all of these were out in abundance, sometimes a couple on the same flower. Dandelions seemed to be the flower of choice for the small torts, peacocks were a bit more interested in the willows and flowering cherries whilst the commas were mainly on viburnum tinus. 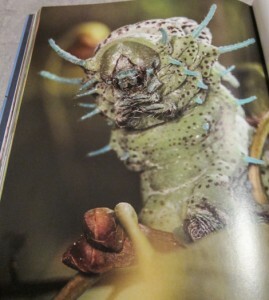 As for the brimstones, they were just dashing about like mad things. So, I took lots of photos, had a big smile on my face, saw some bees and discovered that in contrast to the rest of them, commas have white legs. On the upper side of their wings commas are a beautiful bright orange, but underneath they look like an old dried up leaf – move along birdies, nothing to eat here, type of leaf – a dull, brown, raggedy old leaf. 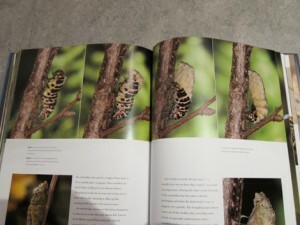 This is in fact the only butterfly with such jaggedy wings, although they are perfectly symmetrical in shape. 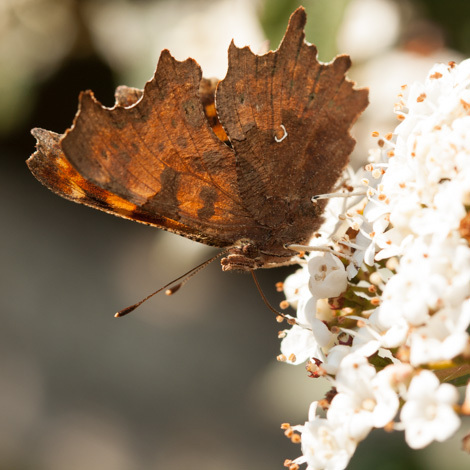 However, they are named for the small, white, comma shaped mark on the underside of the wing. I suppose it is better than being called a dried up old leaf butterfly. As usual, I only saw single specimens of these, as they are one of the few spring butterflies that isn’t often seen in any groups with others of its kind. 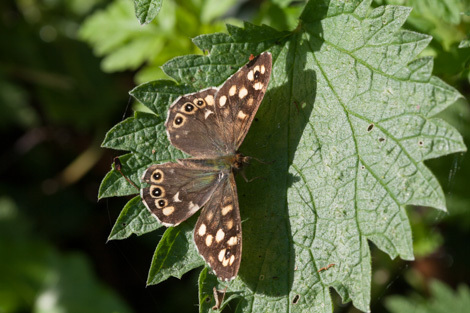 Once the weather finally makes up its mind to be warm for more than a few hours, have a look for this butterfly, the Speckled Wood, Pararge aegeria. 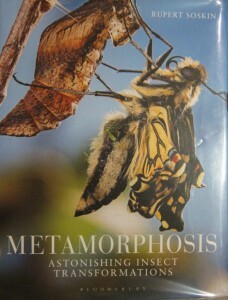 It’s quite a common butterfly and should be out and about in the beginning of April. Like many of the browns, it tends to breed on grasses, and this one likes soft grasses in dappled shade. In Daventry there will usually be quite a few along the old railway track and in the country park. The sunlight usually picks up their distinctive yellow spots (numbers and markings vary) and often several will be seen having a bit of a tussle in the air. 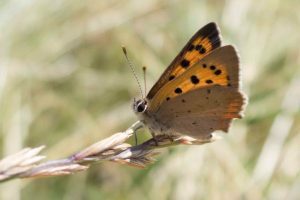 Posted on April 5, 2015 March 29, 2015 Categories Local Patch, NatureTags butterfly, Nature, speckled wood, SpringLeave a comment on Have you seen this butterfly? I’m not very good at recognising different types of mushrooms and toadstools. I’ve been on an organised fungi foray over at Gamlingay Woods, I’ve taken pictures and put them on iSpot, but I can rarely remember what they are called or remember having seen them before. In fact I can count on two fingers the ones I can recognise and name immediately on sight. This, is one of them. 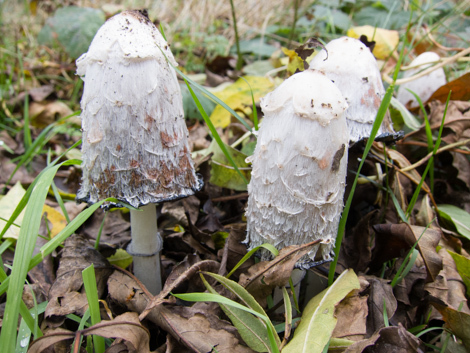 This is a shaggy ink cap (Coprinus comatus) – comatus means hairy and refers to the scales that are clear once the cap has pushed out of the ground. 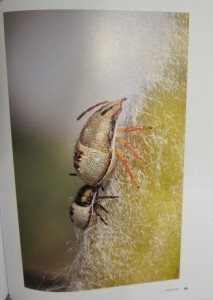 They pop up all over the place and are widespread across Europe and North America. 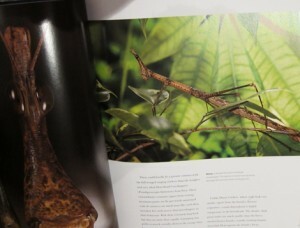 In fact, if you are an urban naturalist then you are in luck because they are often found in the green spaces in towns. They first form as little egg-shaped white caps peeping out of the soil, and, as they grow the gills turn from white to pink to black as they liquefy themselves to death from the edges forming an inky like substance as they spread their spores. In the end there is just a white stem with some inky remains at the top. They are supposedly edible, although not that tasty and not poisonous, but have to be eaten pretty quickly as they will have liquified themselves within a couple of hours of picking. However, as with all mushrooms you need to really know your stuff to prevent accidentally picking something poisonous. Not all yellow flowers are dandelions. If you look around for the next six months you will see a lot of flowers – but how many do you actually recognise, how many do you stop to look at in more detail. Take Coltsfoot for example. Until today I didn’t know what it was, I had heard the name, but wouldn’t recognise it at all. It caught my eye because although it looked like a dandelion it was standing proud of the waste ground in groups. Apart from looking beautiful with such an interesting stem coltsfoot are recognisable in spring by their lack of leaves. These appear after the flowers have died back and give the flower their name – apparently looking like a horse’s footprint, but not exactly convincing. These leaves can grow up to 1.5m tall – that’s nearly as big as me! 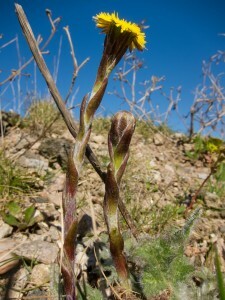 However, the latin name Tussilago farfara is derived from its traditional medicinal as a cough medicine – tussis meaning cough and ago to act upon. It has also been used for skin treatments, gout, rheumatism, colds and viral infections. More recently though there are concerns about potential liver damage that could result from its use. This is due to the pyrrolizidine alkaloids that are found in coltsfoot along with other members of the daisy family such as ragwort. 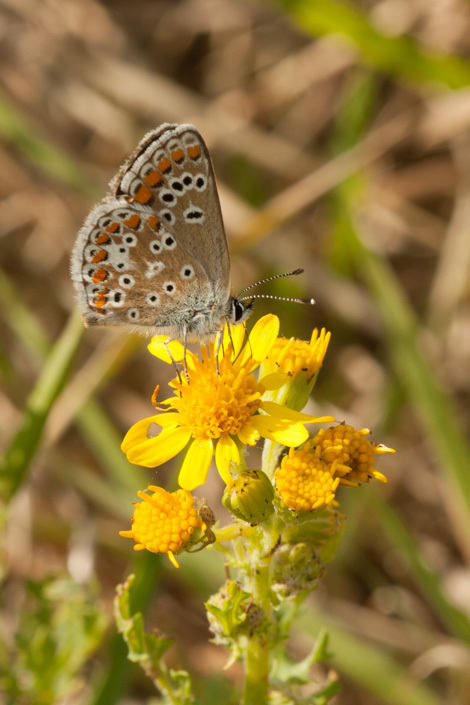 It is these chemicals that attract the caterpillar of the cinnabar moth to ragwort in such numbers as they use these poisons as a deterrent against predators. 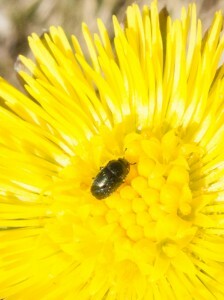 However, the levels in coltsfoot are much lower than those in ragwort. 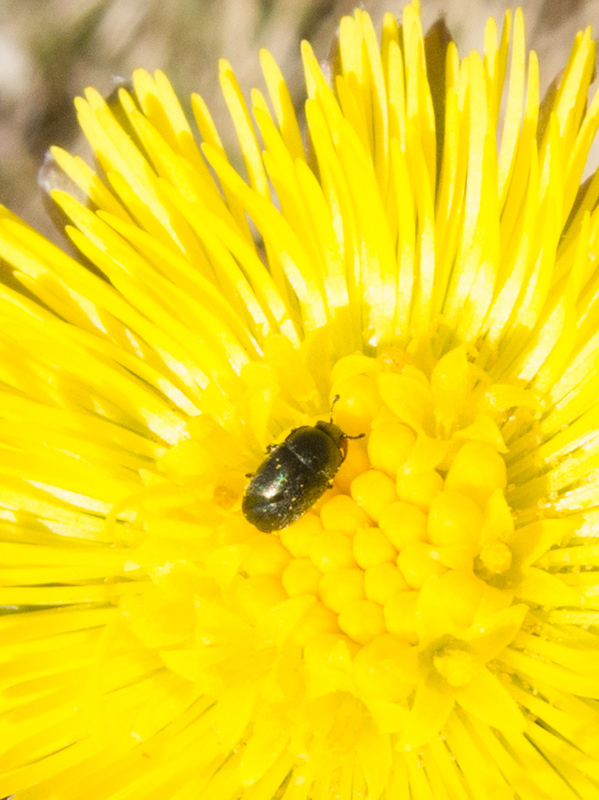 As it appears so early in the year (they flower as early as January and last through into March) it provides an important food source for many insects including honey bees as well as this little beetle. 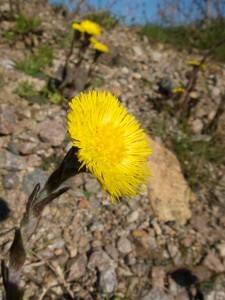 Posted on March 17, 2014 March 16, 2014 Categories NatureTags coltsfoot, flower, NatureLeave a comment on Not all yellow flowers are dandelions. 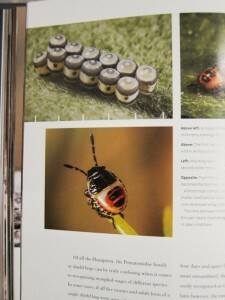 Every year I learn more and more about the natural world surrounding me. I find that for every creature that I learn to identify there are at least a dozen more waiting for me. One of the advantages of working in my current location is that I can quickly get to the riverside and look for wildlife. In the sunny days of early May (which, looking at the grey sky seem a long time ago) I went looking for the first butterflies of the year. I saw a few, but they were disturbingly small in number. 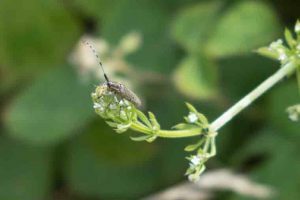 However, I did come across this fly which I had never noticed before and which is apparently fairly common and widespread. 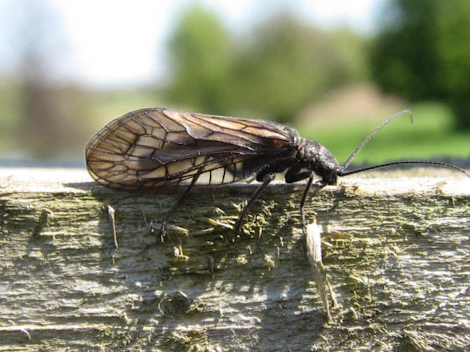 Not very exciting you might think, and you would probably be right – the Wildlife Trust site describes them as sluggish and apparently dead alder flies are used as fishing bait. However, I have never noticed them before even though they were everywhere on the day I went for a walk. 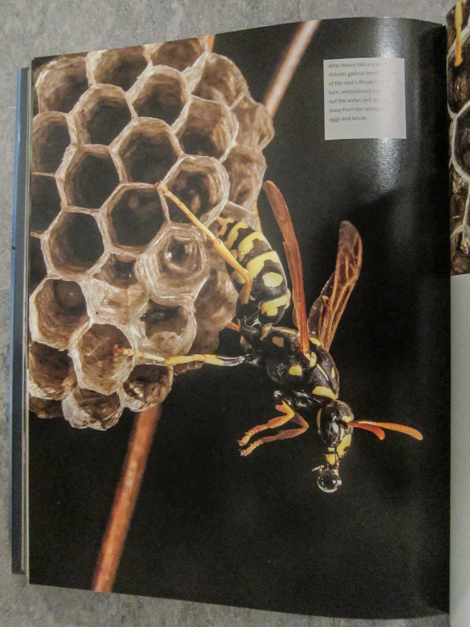 And, look at the detail in the wings. How can you fail to be impressed by that! Apparently, they have no connection with Alder other than being found near the edge of water (where the female lays about 200 eggs) which is where Alder is commonly found. Being sluggish they spend most of their time near the water where they hatched and where they live as carnivorous larvae for a couple of years before pupating into these adults. 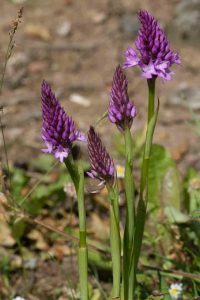 In case you are interested they are about 2 cm in length and there are several varieties which require expert identification to differentiate them.